Fernando Aguerre was born and raised in the coastal city of Mar del Plata, Argentina. From a very early age Fernando was groomed by his father, a successful attorney and ranch owner and his mother, an attorney and a psychologist to become a lover of the ocean and an entrepreneur. Fernando is proficient in English, Spanish and Portuguese and maintains a basic knowledge of Italian and French. His fluency in language is one of the many traits which lead him to his success in international business and nonprofit organizations. Fernando had his first taste of becoming an entrepreneur at the age of 12. His brother and longtime friend, Santiago, introduced him to surfing in 1969 which resulted in a passion that shaped the future of surfing in Argentina and the rest of world, and that has since encompassed his whole life. His first business was a surfboard repair shop. During the military dictatorship of the 70’s, in 1977 surfing was banned in his native Mar del Plata. Fernando founded the Argentinean Surfing Association, promoted surfing, and organized the lobbying for the lifting of the ban. He got the ban lifted a few months later, which was followed by a surf boom. He also founded the first surf and skate magazine in Argentina and opened Ala Moana, the first surf and beach clothing store in his hometown of Mar del Plata. The Surfshop evolved into one of the leading beach clothing manufacturers in the country. In the midst of his surfing career, Fernando entered Law School in 1978. He continued to run the Argentinean Surfing Association and maintained his duties as managing partner of the surf shop while attending law school. In 1984, Fernando completed law school and with a law degree in hand, turned down offers from both his father and friends to join their law firms, resigned as president of the Argentinean Surfing Association and left for California to join his brother, Santiago. By early 1985, the Aguerre Brothers were into something new – beach sandals. From this modest beginning of a two man, one desk operation with the sale of 3,000 pairs in 1985, the leading surf brand Reef originated, eventually becoming the #1 beach sandal company and one of the leading surf labels in the world. Fernando continued to run Reef as CEO until 2003 and in early 2005, looking for a lifestyle change closer to family, waves and charitable work, the Aguerre brothers sold Reef to VF, the largest apparel company in the world. In May of 1994, Fernando was elected President of the International Surfing Association. He has been a key player in the recent expansion and promotion of his beloved sport and his passion for surfing has been an inspiration for many surfers around the world. Fernando led the ISA in obtaining recognition by the IOC in 1997. It is under Fernando’s leadership that the ISA has grown to its current status as the very recognizable and widely respected International Federation for wave riding sports. The ISA sanctions three annual events – the Quiksilver ISA World Junior Surfing Championship, Billabong ISA World Surfing Games and ISA World Masters Surfing Championship; and has the following development programs: Adaptive Surfing Program dedicated to the support of surfing for all; a Scholarship Program created to financially support young surfers in need of financial support to further their education and surfing careers; a Coaching & Judging Program to further develop the teaching of surfing; and a Surf School Register dedicated to providing legitimacy to surf schools for the safety of surfers around the world. Fernando has always been heavily involved in the sport of surfing. In addition to his long term Presidency at the ISA, he co-founded PASA, the Pan American Surfing Association in 1992 which he presided until 2002, when he decided not to run for re-election. He serves in the Senior Advisory Board of Directors for SIMA (www.sima.com), the Surf Industry Manufacturers Association of the United States and as President of the SIMA Humanitarian Fund (the humanitarian arm of the surfing industry). Fernando actively participates as a member of several humanitarian and environmental surf based organizations, always as an unpaid volunteer in search of his dream of a better world. He’s the father of 16 year old triplets. He continues to surf daily, near his home in La Jolla, California. Karin Sierralta was first elected as a Vice President to the ISA in 2008. In 2012, he was re-elected to continue for his second 4-year term on the ISA Executive Committee. A devoted surfer and competitor since 1980, Karin has been a driving force in the development of professional surfing events as well as the organization of international surfing events throughout Latin America. In 2002, he co-founded ALAS (Latin Pro Tour) and to this day holds the position of Executive President. He has also served as the Executive Director of the Peruvian Surfing Federation, FENTA, since 2008. As a member of the ISA Executive and technical Committees, Karin works alongside the ISA President, Fernando Aguerre and the other Vice Presidents to grow and expand the footprint of the sport world-wide. Barbara Kendall competed in 5 Olympic Games from 1992 to 2008 in the sport of Windsurfing. She won Gold 1992, silver in 1996 and bronze in 2000. Barbara also won 11 world championship medals and 25 national championships during her athletic career in International Windsurfing. In 2005 to 2016 Barbara was a member of the International Olympic Committee Athletes Commission advocating for the rights of athletes and woman on many different International commissions and executive boards for the betterment of Global Sport. Her roles included chairing the Oceania Athletes Commission for 12 years, chairing the Association of National Olympic Committees Athletes Commission for 5 years and an active member on the IOC Woman in sport and sustainability and legacy commission. In 2018 she led a very successful New Zealand Youth Olympic Team to the Youth Olympic Games in Buenos Aries as the “chef de mission’. In 2019 Barbara was made a Companion of the New Zealand Order of merit (CNZM) for her services to sport leadership. This award adds to her Member of the British Empire (MBE) in 1993. She was won the Sport New Zealand Leadership award in 2014 and became a New Zealand Olympic Committee order holder in 2016. Barbara completed a bachelor in Social services, career practice (BSS) and a Diploma in Applied Management in 2013. Barbara is currently a Non-Executive director on ARRIA an Artificial Intelligence technology company in data analytics and information delivery. She is a founder of Champions IQ delivering workshops in Leadership, Self Intelligence and Performance and an ambassador for Health 2000, the New Zealand Olympic Committee and Project Litefoot. When Barbara isn’t travelling the world she relaxes in Whangaparaoa New Zealand with her husband Shayne Bright and their two teenage daughters who all surf at every opportunity. Casper Steinfath is a 24 year-old surfer and StandUp Paddler from Klitmøller, Denmark. He was elected ISA Vice President at the Annual General Meeting during the 2014 ISA World Surfing Games in Peru. Kirsty Coventry is Africa’s most successful Olympian of all time and the top individual female swimmer in Olympic history. She has competed at every Olympic Games from Sydney 2000 to Rio 2016, winning Gold in Athens 2004 and Beijing 2008. She is also a seven-time World Champion and broke world records on five occasions. Coventry was voted in as Vice President at the 2016 Biennial General Meeting at the 2016 VISSLA ISA World Junior Surfing Championship in the Azores Islands of Portugal. The ISA World Surfing Games organized in Biarritz as part of the support for the Paris bid, demonstrates to the IOC the legitimacy of our discipline. Surfing contributes to the attractiveness of our national tourism, hence the influence of our training and our know-how. The France team is world champion. Paris organizes the games in 2024. Surfing must remain in the list of disciplines in the program. Election at the 4th term of president of the federation. Surf is Olympic in Tokyo. France is the fourth world nation. First title of Junior World Champion. France is ranked 4th in the world. Election Vice-President of the European Surf Federation. Organization of the first championship of France Handi Surf. Election to the second term of president of the federation. First title of vice champion for the team of France. France enters the five world first nations. College teacher of Arcachon. Implementation with Bordeaux Rectorate of the first session of optional surfing at BAC. Election for the first term as President of the French Surf Federation. Development of societal actions. Organization of international competitions. Reorganization of the high level. EPS professor Collège d’Arcachon. Reinstatement on a post of professor of EPS on the academy of Bordeaux. Preparation of the election for president of the French Surfing Federation. 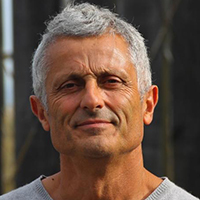 Deputy National Technical Director of the French Surf Federation in charge of setting up the high-level course, school programs, international relations. Trainer in physical preparation at PSG omnisport. Technical Framework Paris Region Ile de France Handball in charge of the regional high level and development. Integration of the national framework on young potential. Montreuil Handball Coach D1. Internship at Insep in Physical preparation. First return to Paris at Lycée Carnot. Season of lifeguard on post of different beach of Gironde. Postmaster for 6 seasons. Surf practice which remains the best school to apprehend the waves and dangers of the ocean. President of Nippon Surfing Association. 28 years of experience at the national federation with various executive positions. Since 1990, contributed to major national championships such as All Japan Surfing Championship as a head judge, contest director and involved with management of Nippon Surfing Association. Elected to be a member of the board in 2000, chairman of committees in 2007, and President in 2011, currently serving 4th terms. After establishing Shirahama (meaning white beach) surf team in 1982, started own business, Shirahama Mariner in 1988. Incorporated in 2013, the company imports and sells marine sporting goods and fashion items, and provides related services as well as operates accommodations. • Currently serving 4th terms. Chairman of the Executive Committee, Nippon Surfing Association. • 2009 18th ISA World Junior Surfing Championship, Salinas, Ecuador. As comfortable on a shortboard as on a longboard, the French Woman is above all known for its audacity to chase the biggest waves in the world. From Belharra where she became known to the general public surfing a giant wave during the winter of 2013, Mavericks in 2015, Justine Dupont is not cold. In January 2016, she again attacked the Basque mountain of Belharra. Before taking the biggest wave ever sucked by a woman in Nazaré (Portugal) in February 2017 : a mountain of almost 90 feet ! Passed by swimming, athletics and sailing, she is a brillant competitor, a member of the French surf, SUP and longboard teams, and her results in WSL as ISA competitions testify to its technical qualities. IN 2013, she finished runner-up in the ISA World Longboard Championships and won the gold medal with Team France ! Few months after, she finished 3rd at the WSL Longboard World Championship. Member of the WSL Championship Tour during the 2012 season, she is the first European to win a QS 6-star in the same year. ISA World Longboard Championship runner-up and N.3 WSL world longboard in 2013, she knows how to adapt whatever the support and the size of the waves. Pensioner of the Pole France for two years, she obtained her French high-school diploma with honors. Justine Dupont distinguished herself at the 2015 edition of the French championships in Biarritz by winning the title in both surf and longboard division. She finished 12th in the 2015 QS season and did not qualify for the CT. Selected to compete in the 2016 ISA World Surfing Games, Justine took the 4th place in Costa Rica. She is again selected with “Les Bleus” for the 2017 ISA World Surfing Games in Biarritz. She wins the relay world title with her teammates and the gold medal of the nations ranking. In September 2017, she was in Denmark with the French team for the ISA World SUP Championships. She finished runner-up in Sup Surfing and takes the silver medal of the ranking of nations with her teammates. After having talked a lot about her throughout the winter of 2017/2018 by loading huge waves from Nazaré to Jaws, she is named representative of the surfers at the International Olympic Committee for the 2020 Olympics. At the 2018 ISA Biennial General Meeting in Tahara, Japan, a new ISA Constitution was approved and the composition of the ISA Executive Committee (ISA EC) consequently expanded to include 2 new Regular Members and the Chair of the ISA Athletes Commission. The ISA EC is therefore now comprised of the ISA President, four Vice Presidents, 2 Regular Members, the Chair of the ISA Athletes Commission and the ISA Executive Director as member ex-officio. The ISA EC is responsible for defining the ISA’s overall strategies, objectives and direction in accordance with Article 6 of the ISA Constitution. From left to right: VP Barbara Kendall (NZL), VP Karin Sierralta (PER), President Fernando Aguerre, Jean-Luc Arassus (FRA), and Atsushi Sakai (JPN).